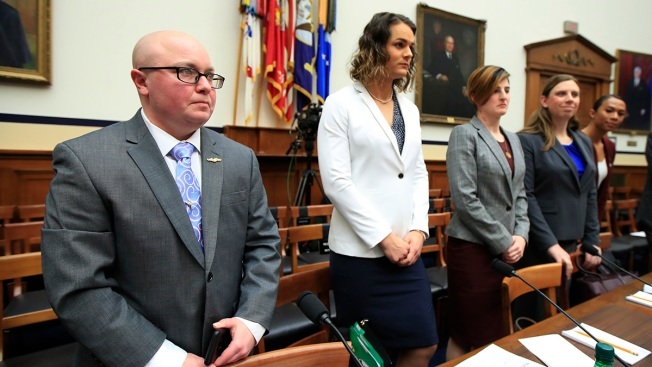 FILE - From left, transgender military members Navy Lt. Cmdr. Blake Dremann, Army Capt. Alivia Stehlik, Army Capt. Jennifer Peace, Army Staff Sgt. Patricia King and Navy Petty Officer Third Class Akira Wyatt, are briefed about hearing procedures before the start of a House Armed Services Subcommittee on Military Personnel hearing on Capitol Hill in Washington, Feb. 27, 2019.